For a magnificent, bedroom décor, combine this gorgeous, Western style bed with our Vasco dresser (dress18) and with our Sancho end tables (etbl02). The padded front of the headboard is upholstered with exquisite, green tone, patterned, full grain leather, and the junctions of the leather are double stitched together for extra strength and durability. Adjoining the leather panel is a hand forged, iron border, which is highlighted with intermittently hand tacked, hand forged, iron conchos. 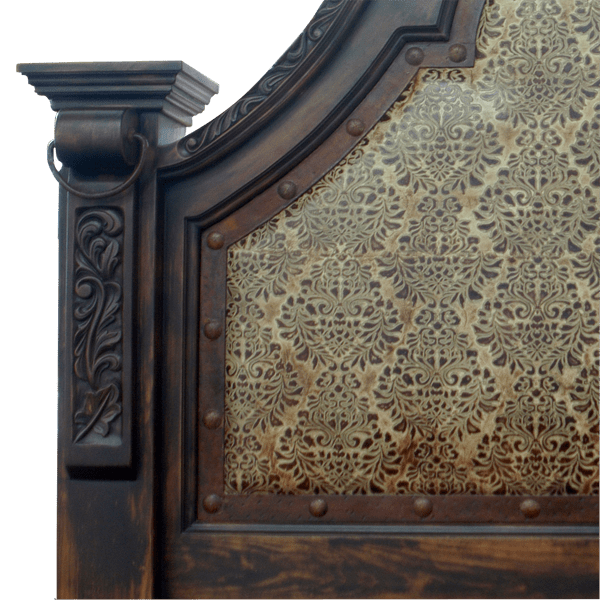 The curved, framed headboard has an arched top, and its top frame is enhanced with hand carved, beveled designs and with ornate, hand carved, floral and scroll details. The headboard is framed on each side with solid wood uprights, and the top of each upright is accented with a hand forged, iron ring and with a staggered, top molding. The face and the sides of each upright are embellished with graceful, hand carved, floral and scroll designs. The bed has a rectangular, framed footboard with a staggered, top rim. 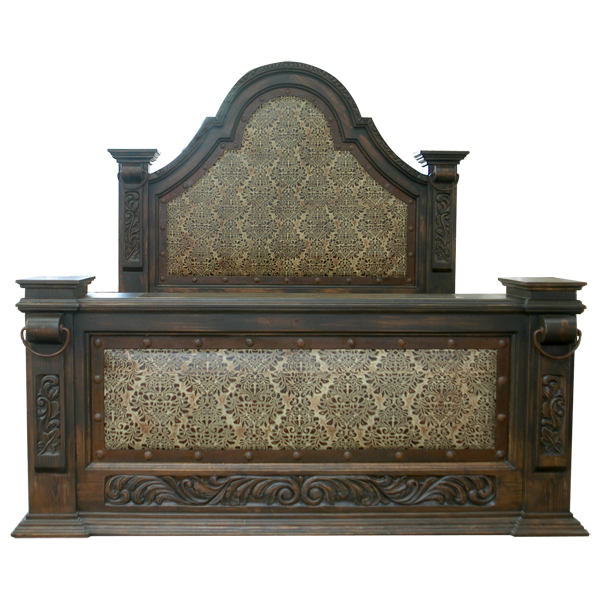 The padded front of the footboard is covered with matching, patterned, full grain leather, and adjoining the leather panel is a hand forged, iron border. The iron border is adorned with intermittently hand tacked, hand forged, iron nails. The area below the leather panel has exquisite, hand carved, floral and scroll designs. The footboard is framed on each side with solid wood uprights, and the top of each upright is garnished with a hand forged, iron ring and with a staggered, top molding. 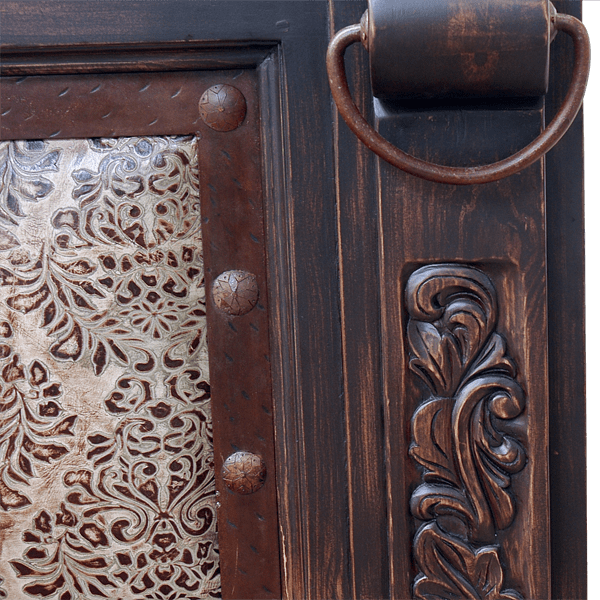 The face and the sides of each upright have beautiful, hand carved, floral and scroll designs. 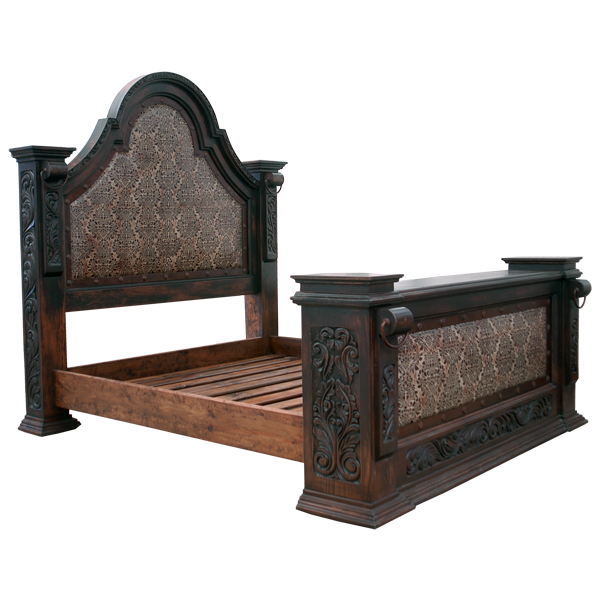 The bed has solid wood rails, and it rest on a staggered, wood molding base. It has an opulent, dark finish, and it is made with the best, sustainable, solid wood available. The bed is 100% customizable.